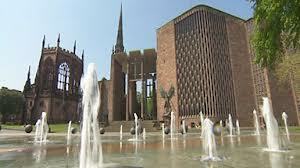 This Summer’s choir tour sees the the Priory Choir sing the round of services at Coventry Cathedral from Wednesday, August 7th to Sunday, August 11th. and 4.00 pm Choral Evensong. Previous choir tours have seen them sing in Gloucester Cathedral, St Albans Cathedral and Peterborough Cathedral. Like St Mary’s Priory Coventry Cathedral was once home to a Benedictine community . The cathedral itself was badly damaged in the blitz during World War II, and has subsequently become a centre of reconciliation. 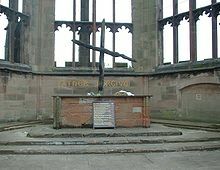 The wooden cross and the cross of nails were created after the cathedral was bombed. The cathedral stonemason, Jock Forbes, saw two wooden beams lying in the shape of a cross and tied them together. A replica of the wooden cross built in 1964 has replaced the original in the ruins of the old cathedral on an altar of rubble. The original is now kept on the stairs linking the Cathedral with St. Michael’s Hall below. 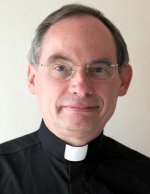 Abergavenny resident Archdeacon of Monmouth, The Venerable Richard Pain is to be the next Bishop of Monmouth. Fr Mark welcoming his appointment said, “We will have another teacher as Bishop, as Richard is a biblical scholar”. We have sent best wishes to our Royal Patron HRH The Prince of Wales on becoming a grandfather, following the birth of a son to TRH The Duke & Duchess of Cambridge. 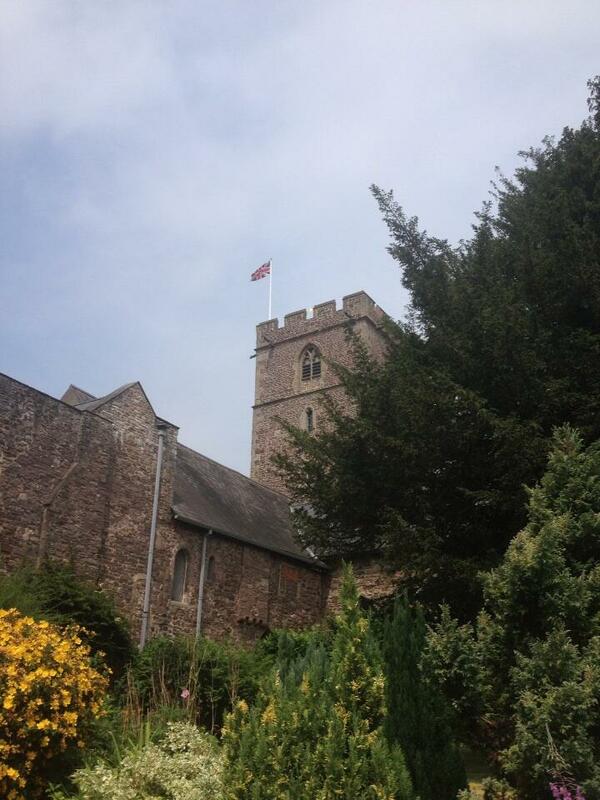 Flag flies to mark Royal birth and the church bells rang out. as they welcome their son and grandson into the world. Surround the family with the light of hope and the warmth of your love today and always; through Jesus Christ our Lord. This week we said goodbye to Diane Williams after founding and leading the Little footprints Mother & Toddler group at Holy Trinity Hall, Abergavenny for the past 7 years. There were lots of tiers from parents and toddlers as we thanked Diane for her inspirational leadership. The Vicar Fr Mark Soady said, “She will indeed be a hard act to follow, but we have had volunteers who will take over when we return in September”. 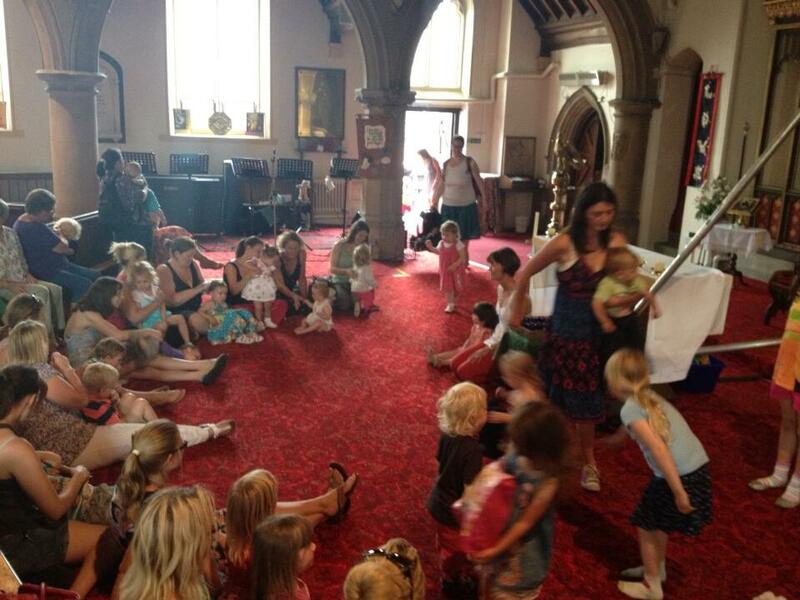 All toddlers who left were given a Bible Story Book and were prayed for. THE creator of HM The Queen’s Coronation Jubilee Windows at Westminster Abbey, Helen Whittaker, has been chosen as the prefered designer for the stained glass Jesse Window at St Mary’s Priory Church, Abergavenny, in memory of its late Vicar the Very Revd Jeremy Winston. Three shortlisted artists were asked to produce a design for the window from which the Appeal could choose a designer.The Cottam Will Trustees,who have pledged significant support to this project, were represented on the selection panel by Roger Evans and Richard Halsey. Mr Evans said after the meeting that he was thrilled by the outcome and believed that the new window would make an exciting and lasting contribution to St Marys Priory Church and the wider community. The present Vicar of St Mary’s Priory, Fr Mark Soady, “I am excited by the prospect of working with Helen to develop her ideas into a window which, with the agreement of all stakeholders, can become the most important contribution to church art for a number of generations”. Helen Whittaker is Creative Director of the renowned Barley Studios in York. Helen’s stained glass windows can be seen in many churches and cathedrals throughout the country. Helen is an alumni of The Prince of Wales School of Architecture and is a visiting tutor for their School of Traditional Arts. Her MA thesis was on Jesse Trees. The design is likely to go through a number of changes before we reach the final version. Further details of how Sunday’s Armed Forces’ Day service will be adapted to remember those caught up in the TA tragedy on the Brecon Beacons last weekend have been announced. Katie Garnett, a member of the Brecons Mountain Rescue Team involved in the rescue of the soldiers from the Beacons, and herself a former army signaller, will carry a Book of Remembrance down the Nave of the Priory Church and place it on the Nave Altar. Cllr John Prosser Vice Chairman of Monmouthshire County Council and the County’s representative on the Council of Reserved Forces and Cadets in Wales will read a lesson as will the Mayor of Abergavenny. The Address at the service will be given by former Army Chaplain Revd Ray Hayter , who is currently on the staff of Newport Cathedral. Armed Forces Day will be marked in Abergavenny with a service at St Mary’s Priory Church on Sunday, July 21st . The service will start at 2.30pm following a march of Veterans and Cadets through the town. In the light of last weekend’s news we will remember the TA soldiers caught up in the Brecon Beacons disaster. The preacher will be former Army Chaplain and Cathedral Minor Canon Revd Raymond Hayter OGS.